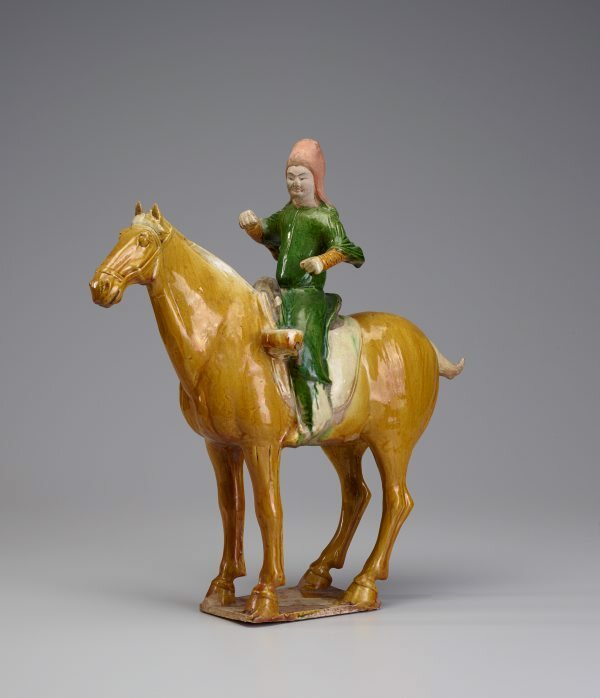 This particularly fine, beautiful and, for such a relatively small model, noble figure of a horse and rider evocatively captures much of the style and flavour of courtly life in ancient China. The figure also illustrates, in the pose of the horse with its heads held high, the qualities of enduring strength and determination that so endeared the almost legendary Ferghana horse, the horses which 'sweated blood', to the early rulers of China. The model portrays a soldier who, by his distinctively and deliberately modelled facial features, may be recognised as of Turkic origin like so many soldiers, retainers and attendants serving at the cosmopolitan Court of Tang China. At the side of the saddle is a circular drum and the hands are poised in a precipitate manner ready to strike. This figure would have been one of a number of such models in a retinue of civil and military figures placed in a tomb and which reflected the status and position of the deceased. Excerpt from: Edmund Capon 'Chinese, Tang dynasty: Horse and rider' Collection Series 2, AGNSW, 1982. The tomb figure tradition is considered to have reached its apogee in the Tang dynasty. This horse and rider capture the confident cosmopolitan atmosphere of the capital city Changan: the horse is one of the elegant Ferghana horses, the soldier astride him appears to be of Turkic origin, one of the many races who mingled in the Tang capital. (The rider's felt hood is of a type worn by Central Asian horsemen and riders). This figure would have formed part of the military retinue in the tomb of a high-ranking military official or perhaps a prince. Such figures were usually congregated in niches set in the walls of the sloping roadway leading down to the subterranean burial chamber. Typically for such pieces, this equestrian figure is constructed from separate piece moulds and is hollow inside. In this piece the legs, the two halves of the body, the head and the rider were separately cast, and then luted together before firing. The work is decorated in the three colours of cream, green and amber common on Tang glazed tomb figures and referred to as 'sancai', literally 'three colours'. The face was left unglazed to permit the detailed addition of facial features. Jackie Menzies, 'Early Chinese Art', AGNSW, 1983. cat. no. XXXII.